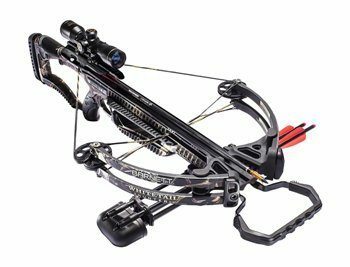 Whether you need it for training or hunting purposes, a crossbow makes an excellent weapon for outdoor activities. 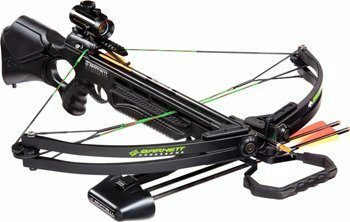 However, finding the best crossbow for the money can be quite tricky with so many options out there. Luckily, we have done the research for you. Take your time to go through our article and make sure they match your necessities. For those who are in a hurry, here are our top picks. We have summarized a comparison table below for your easy reference. However, it is important to note that the positions are in no particular order of importance. 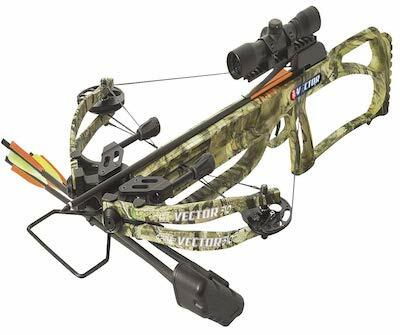 Now, what are the best rated crossbows on the market and what makes them so popular? Let's dive into the reviews. The Wicked Ridge Invader features a full package based on a classic ACU-52 cocking device, a Wicked Ridge 3 arrow quiver a TenPoint 3x Multi-Line scope and 3 carbon arrows. In terms of speed, it's stunning. A fired arrow can go up to 330 feet per second. Even if your prey hears the noise, it won't have enough time to react before the arrow reaches it. The kinetic energy put out is impressive as well – 97 FP. The cocking system is based on a rope and it's integrated. It retracts automatically. Such a system makes drawing much easier, as the weight is greatly reduced by up to 50%. Moreover, the system features a few small magnets that bonds together and hold the handles in place. The bow does not come fully assembled, but there aren't too many parts to be put together. It comes with a small manual of instructions that will give you all the required details. In fact, when we try to fully assemble the crossbow, it only took us lesser than 5 mins. Safety standards are superb for this model. The wings and fore-grip are thoroughly engineered to keep your hand safe under the releasing path of the bowstring. It might feel dangerous at first, but there's literally nothing to be concerned about. Lastly, the unit features a dry fire inhibitor. It's a front running system that stops the bow from firing without an arrow. The Parker X301 is built with quality in mind. The package includes all the required accessories to go out hunting. Apart from the actual crossbow, you also get a multi-reticle scope, a 4 arrow quiver and 4 arrows. Each arrow has field points, while the quiver can be detached within a second. The crossbow may look short at first, but it's just its compact build. It features machined aluminum parts for both durability and good looks. 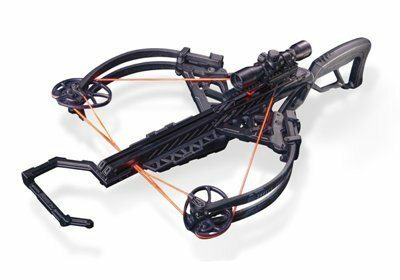 With just 7 pounds in weight, this crossbow is easy to maneuver and carry around, even during long hunting sessions. It has an 11 inch power stroke and a 24.125 inch axle to axle distance. The drawing weight goes up to 160 pounds. In terms of speed, arrows can go up to 300 feet per second speeds. This crossbow is ambidextrous, so it makes no difference if you're left or right handed. It features a red hot string and cable, as well as the EZ drawing technology. 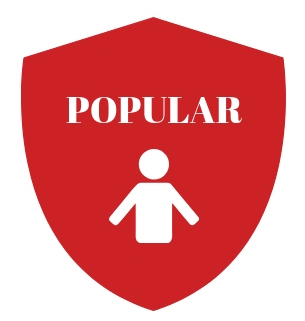 The cocking effort is drastically reduced, making this model easy and efficient to use for both newbies and professionals. It's engineered to inhibit dry fires (without an arrow) for safety, but it also comes with a safety finger flange. In other words, it adds to your accuracy without exposing you to any risk of injuries. It's worth mentioning the G2 trigger too, as well as the camouflage finish. 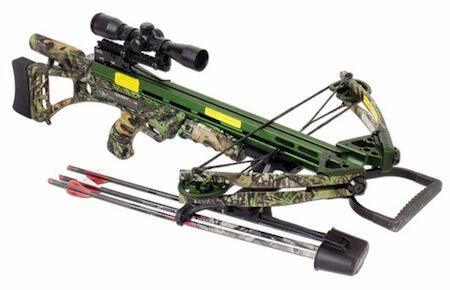 Often rated as the best crossbow among youth, this model from Barnett comes with a professional 4x32 scope, a rope cocking device, a lightweight quiver and 2 arrows – each measuring 20 inch. The package includes some lubing wax as well. According to the manufacturer's specifications, you should lube the strings every 10 shots for maximum efficiency. The bow measures 33 x 14 x 8 inches. It weighs 6.4 pounds – slightly less than its competition. As for the kinetic energy, it goes up to 91.9 feet per second. The drawing weight is stabilized at 140 pounds. Given its speed – 330 feet per second, it's one of the fastest crossbows on the market right now and exceeds most of its competition by over 10%. Modern technologies make this crossbow a front runner. The Trigger Tech Technology guarantees for a 3 pound zero creep release. The Nock sensor keeps an eye on the arrows. The crossbow will never fire dry shots that can injure you. All components are made from stainless steel. They're durable and likely to maintain their shiny looks for quite a long time. While the crossbow is mostly assembled, you'll still have to put some parts together, but it won't take too long. The crossbow allows a tight grip without exposing your hands to any risks at all. A proper grip adds to the overall accuracy and prevents shaking while firing. In terms of efficiency, proper maintenance and regularly lubing strings will guarantee for successful hunting sessions. The excessive speed doesn't allow any accidental shaking or moving as you fire. With a stunning speed of 335 feet per second, this might be the best crossbow in terms of value for money. It is so fast that it gives your target no time to react. All you gotta do is make sure your aim is good. 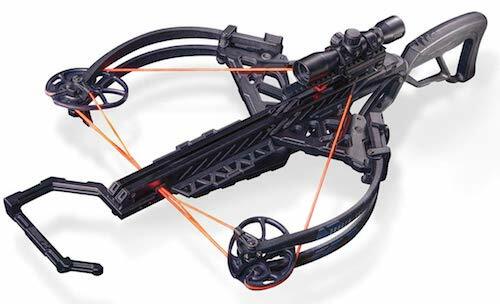 This model is an inverse designed crossbow. It's not a new concept at all. In fact, it has been used for ages. It is, however, extremely consistent and reliable. On another note, this kind of design is known for its compact style. This model won't teach you how to hunt with a crossbow, but it will certainly make your life easier. It comes with a full package that allows hunting out of the box – set it up and go look for some prey. Accessories include a rail lubricant to use on a regular basis for cords, a mount quiver and a cocking sled. Other than that, you'll have a professional Trophy Ridge XF425 scope, as well as 3 arrows. Arrows carry the same Trophy Ridge quality standards. 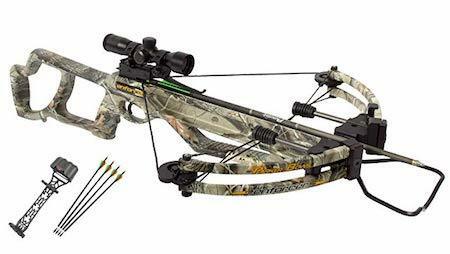 The 34 inch crossbow has a solid 125 pound draw weight and measures 18 inches axle to axle. Its kinetic energy goes up to 99.3 FT. With less than 7 pounds in weight, you'll have no problems carrying it around for hours. Also, it won't put too much pressure on your arms while firing. This crossbow from Bear X is built with the 3 Times Safe trigger technology. In other words, whenever you pull the string, it will automatically go to safe, even if you forget about it and leave it in a firing position. The anti dry fire system works with no issues at all. The Power-V riser aims to reduce the stress by evenly distributing it. It goes behind the actual trigger for extra efficiency. As for the PowerLink routing hangers for cables, they work on the bow tune by extending limbs and reducing the cam rotation. Jaguar's new crossbows came with a series of innovations. They were proven to be reliable, so they're still selling these days without any major upgrades or new generations. This model measures 27x35 inches. It's a standard size for crossbows in this segment. It weighs 7 pounds, so it's lightweight and easy to carry around. As for its speed, it may not be the fastest crossbow in this segment, but it can certainly tackle your prey within a couple of seconds. The arrow travels up to 265 feet per second. Obviously, the speed depends on the weight of the arrow, as well as its aerodynamics. The package comes with a 6 bolt detachable quiver, as well as 4 bolts. The bolts measure 16 inches and are made from aluminum. The crossbow is designed in a rifle style – composite stock. It's convenient and easy to hold, . You will not feel any pressure on your arms. The rifle design adds to its stability while aiming, as you can rest it against your shoulder. The barrel is made from slotted cast magnesium. Its main role is to improve accuracy in bolt flight tracking. Small adjustable features make this crossbow suitable for every beginner. You can even adjust the scope brightness for a better view. The scope is fitted on the weaver style rail. It measures 30mm and comes with 7 levels of brightness. 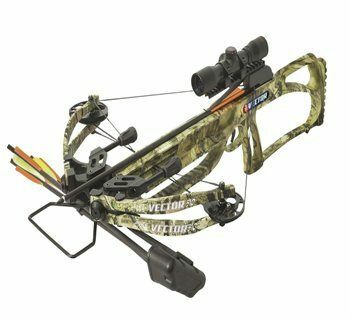 Known as one of the most reliable Barnett crossbows on the market, the Wildcat C5 model comes in a full package containing a quick detaching quiver, as well as a high quality red dot sight and even bolts. Just assemble the unit and you can start practicing. Assembling the crossbow is simple even for first timers. Some parts are separated, such as the limbs and riser. If you're not sure how to put them together, the package comes with a manual of instructions with informative graphics to explain the procedure. The Barnett crossbow weighs 8.5 pounds – a bit heavier than other units in this segment. That's without all the accessories. Once you put everything on, it will weigh around 11.5 pounds. It's still comfortable to hold for a few hours. The design is compact and efficient. The crossbow is 26.75 inches in width and 35.5 inches in length. When cocked, the width is drastically reduced – around 22 inches. Since it features small cams, the crossbow is quite narrow when compared to other similar units. The power stroke is directly responsible for the bolt speed. The crossbow can fire up to 320 feet per second. The power stroke goes up to 13 inches. In other words, you'll be able to pull the string back 13 inches when cocking the crossbow. It's a bit more than other units, hence the higher speed. As for the draw weight, it goes up to 150 pounds. It's quite manageable when you also use a rope cocker. 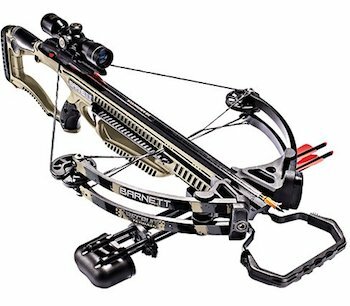 This model could be the best Barnett crossbow out there if you're looking for power and energy. The kinetic energy is rated at 122 – more than its competition. Also, it's about 19 KE more than the previous generation of this crossbow. This crossbow will easily reach 340 feet per second – a front runner. However, it depends on the bolts you use. Most importantly, you'll have an exquisite accuracy even when you shoot from a longer distance. The crossbow is designed to be unobtrusive, regardless of your experience. In terms of comfort, you can also count on the anti dry fire features, as well as a pass through fore grip. The 0.875 inch picatinny rail adds to the comfort as well. In terms of convenience, you'll love the rifle design. You can rest the crossbow against your shoulder and gain extra stability while aiming. The custom laminated limbs guarantee for a durable operation, even at extremely low temperatures. As for the trigger, it carries the TriggerTech quality standards. In other words, it has no creep and it's smooth and easy instead. The crisp release is almost instant. You shoot when you want to shoot, without having to calculate your prey's next move in advance. With around 310 feet per second, this model from PSE aims to deliver. It's so fast that you will inevitably gain in accuracy as well. Just aim and shoot – it's instant and goes straight to the target. Its kinetic energy is rated at 85. To successfully hunt a deer, you'll need a minimum rating of 40. In other words, it's more than enough for whatever you want to hunt with this crossbow. Weighing 6.3 pounds only, this is one of the lightest crossbows on the market. You won't even feel it while carrying it for hours. It also comes with a comfy rifle style design, which allows you to rest it against a shoulder and improve accuracy. The draw weight is rated at 150 pounds, while the power stroke goes to 11.25 inches. The overall length with stirrup is 32 inches. It comes in a few different finishes. 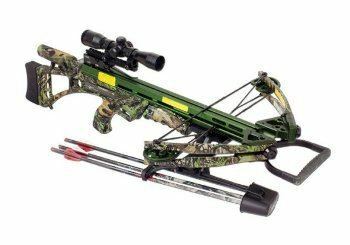 The package is complete and makes this model one of the best crossbow in the market. You won't have to buy anything else. It comes with a 4x32 scope, a sling, 3 carbon bolts measuring 20 inches each, 3 85g bullet pints, a cocking rope, a 5 bolt quiver and a rail lube. A foot stirrup is also included in the package. 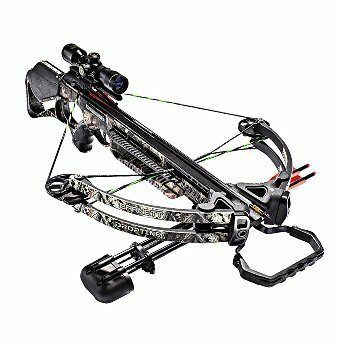 In terms of sturdiness and durability, this model from Carbon Express easily qualify as the best crossbow for tactical use. It comes with carbon infused limbs – durable and lightweight, as well as top quality string and cables. The CNC machined riser and the green anodizes flight rail add to its quality. They're durable and made to last. The riser design is unique to Carbon Express only. 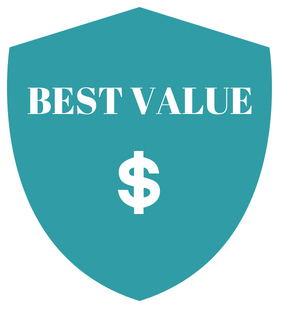 The package is full and leaves no room for further investments. You won't have to purchase other items separately to use the crossbow at its full capability. All in all, you'll also receive a 3 arrow quiver with quick detaching features, a rope cocker and 3 PileDriver arrows. A scope, 3 practice points and a rail lubricant are also included. Maintenance is simple and doesn't require too much work. Basically, you'll have to use the rail lubricant after every 10-15 shots. 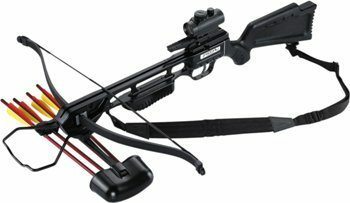 Using the crossbow is easy, yet this model is designed as a tactical unit. In other words, newbies might find it a bit challenging, yet it'll help them improve their game in no time. It weighs 10.5 pounds with all the accessories on, so it's slightly heavier than other similar units. However, it's still comfortable to use. It fires at 335 feet per second and provides 119 foot pounds of energy – one of the most powerful crossbows on the market at the moment. 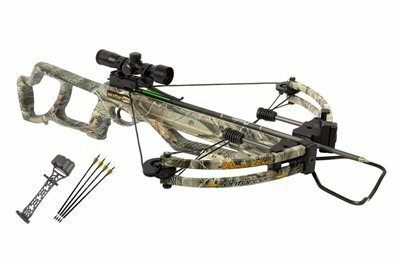 This crossbow features assembly tools, a scope, a quiver for 3 arrows, 3 20 inch Headhunter arrows, a warranty card and a manual of instructions. However, there is no rope cocking device for this model. Assembly is not too complicated, however, if this is your first crossbow, we recommend you to check the manual first. 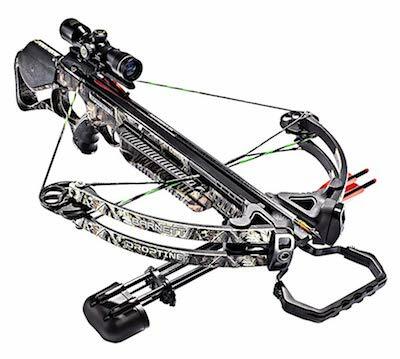 The crossbow features a solid 160 pound draw weight, as well as a 13.5 inch power stroke. Such numbers will most likely push the arrows at 350 feet per second. Obviously, it also depends on the arrows you use. But generally, the kinetic energy will range around 109 foot pounds. The bow weighs 7.6 pounds, but that's with no accessories on. It's comfortable to hold and aim without feeling any tension. The accuracy is quite good given the scope, yet you'll have to get used to it. Barnett has managed to drastically reduce the heaviness of this crossbow in the front as well, yet you may still feel it. However, the scope and the speed do an excellent job together. The 160 pound draw will challenge you a little. For this reason, many newbies would rather invest in a rope cocking system, yet it must be purchased separately. 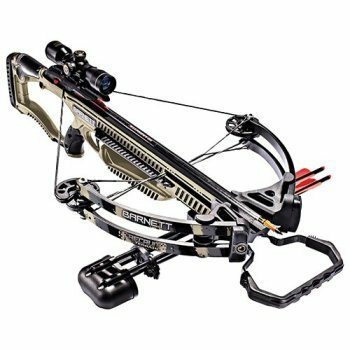 Bottom line, choosing the best crossbow for the money will indeed feel quite challenging. It's not impossible though since we have already done the hard work for you. All you have to do is just to assess your needs, expectations and most importantly your skill level. 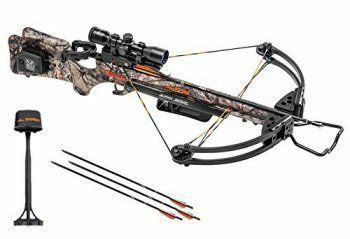 Each of the above mentioned crossbows can definitely improve your game. Based on our research, we find that the wicked ridge invader is our best choice. Reviews from many users has also been very positive. We tested this crossbow ourselves and we confidently give it a 5 out of 5 star rating.